SPACE FLEX TECHNOLOGY – New space flex technology, to save weight, gain comfort and performance. CARBON BEAM – The carbon beam construction gives a board more dynamic flex for better pop and the same durability but with 10% reduced weight. PREMIUM CONSTRUCTION – The premium construction gives a board a faster and even more progressive flex for better pop and reduced weight. SOFT FLEX – The soft flex guarantees a comfortable ride in all conditions. STEP MONO CONCAVE BOTTOM – The fastest and easiest to ride bottom concept. it can be carved easily through turns and always delivers the right grip. it planes early, allows smaller fins and helps to go upwind with ease. GRAB RAILS – Grab rails for easier board off maneuvers and comfortable general handling. The Soleil was one of the first kiteboards designed by women for women, and that concept holds true today. Completely redefined, the Soleil is now offering the Space-Flex Technology. The Carbon Beam construction provides the board with a lively feel that is very reactive to rider input. Rail to rail carving is a dream while the pop is impressive. The softer flex in combination with the Space-Flex Technology ensures the ride is smooth, even on the choppiest of days and the Step Mono Concave bottom gets you going early. Due to the new grab rails, the lightweight and the narrow width of the board, it becomes much easier to handle and to control, even in windy and rough conditions. 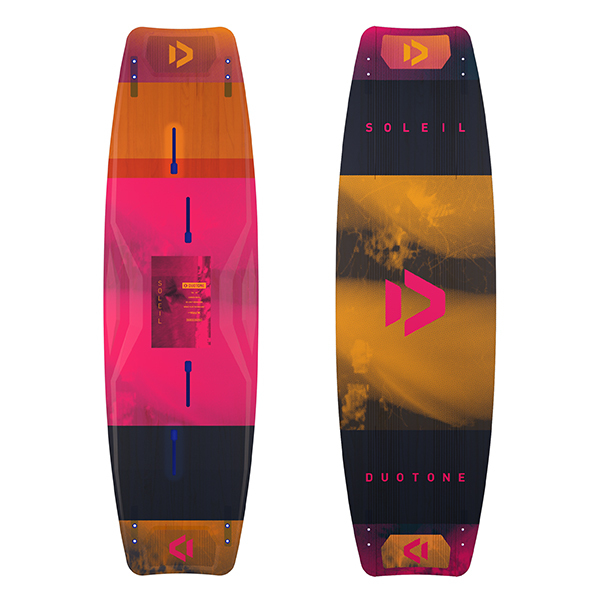 Many brands go with the “pink it and shrink it” approach, with the Soleil you get a female specific board that was designed and built from the ground up for women. You deserve something special; the Soleil was made just for you! **2019 Duotone Boards are supplied as a board only, including fins, please order binding or straps and pads separately. All Duotone Boards are compatible with the NTT Combi system & the Vario Combi system. ** 2019 Duotone Gambler and Hadlow Team series are compatible with Duotone Boots. Other Boards in the Duotone Range are not warranted for the use of Duotone or any other manufacturers Boots or Binding systems.